Do you love the scent of lavender as much as we do? If so, you will love this simple, all natural, chemical-free DIY sugar scrub recipe. 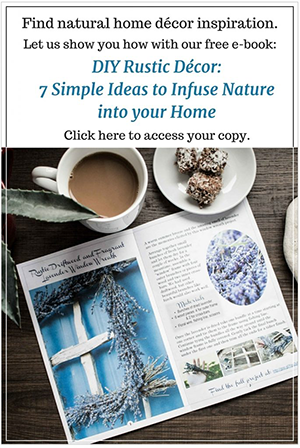 It’s the perfect addition to our new coastal cottage kitchen with touches of farmhouse style including a lovely new faucet from Delta Faucet Canada! Disclosure: This post is sponsored by Delta Faucet Canada. However, all opinions expressed are our own. Moreover, this post contains affiliate links which means if you buy any products through these links – at no additional cost to you – we make a small commission. You can find our full disclosure here. 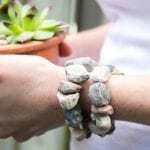 With the additional time weeding and digging in the garden these days, I find I need a little extra exfoliation to get the dirt off my hands. There’s something so luxurious yet natural about a good sugar scrub, especially with lavender added in! This DIY recipe will leave your hands feeling smooth and soft by helping to remove dry and dead skin. And what’s more, it only takes a couple minutes to mix all the ingredients! Whether you’re making this hand scrub for yourself or as a gift, get ready for the relaxing and aromatic scent of lavender along with the massaging properties of the sugar. 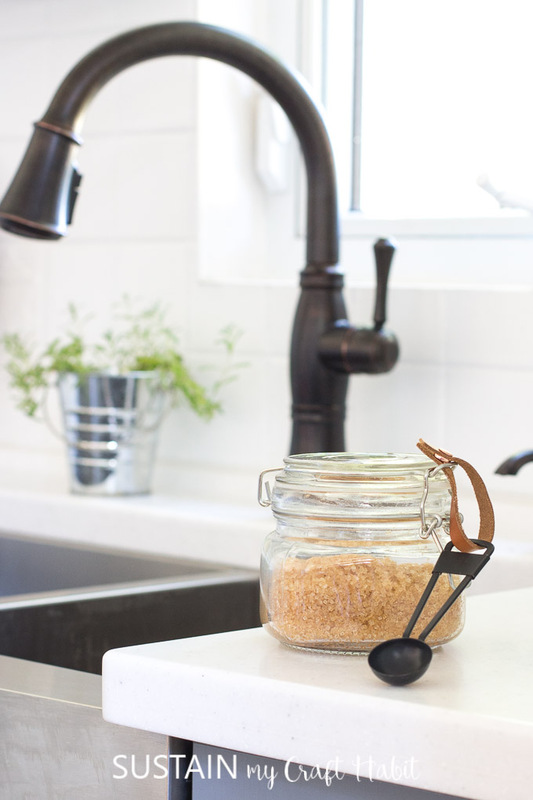 We’ve placed our sugar scrub next to our brand new coastal kitchen faucet for our selves and our guests to enjoy. Continue reading to find the ingredients and how-to instructions for making your own DIY sugar scrub below. Guys, check out that gorgeous faucet (insert many heart eyes here)! 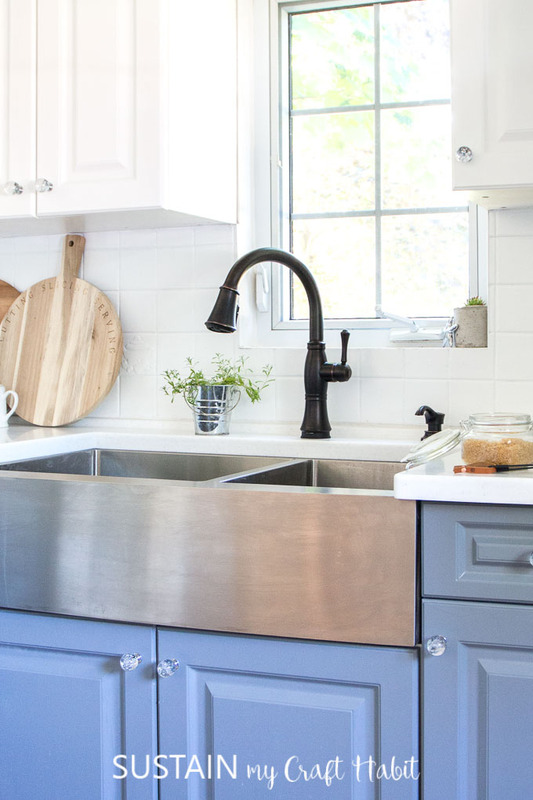 We were beyond excited to again partner with Delta Faucet Canada for this makeover. If you recall, last year we incorporated beautiful new fixtures from their Ashlyn Collection in our Beach Themed Bathroom makeover at the cottage. This time around we selected this stunning single handle pull-down faucet in a Venetian Bronze finish from the Cassidy Collection. 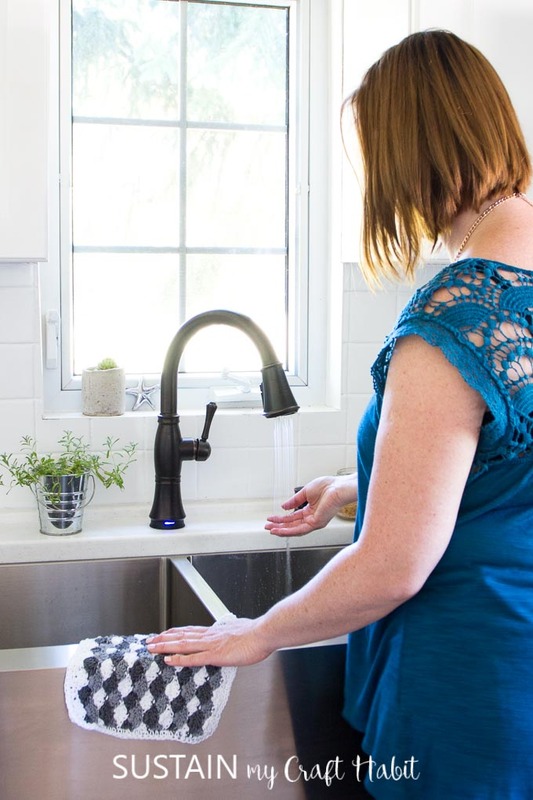 This faucet gives our new coastal cottage kitchen that little farmhouse vibe which we were hoping for. We love the contrast of the dark finish next to the white counters and modern stainless steel apron sink. Moreover, the faucet has Touch2O technology – just touch any part of the faucet to turn it on and off! So cool and perfect when your hands are covered in sugar. Mix the raw cane sugar together with the pure virgin olive oil until it is well blended. Add 3-4 drops of lavender oil to the mixture and blend together. Pour into the resealable container. 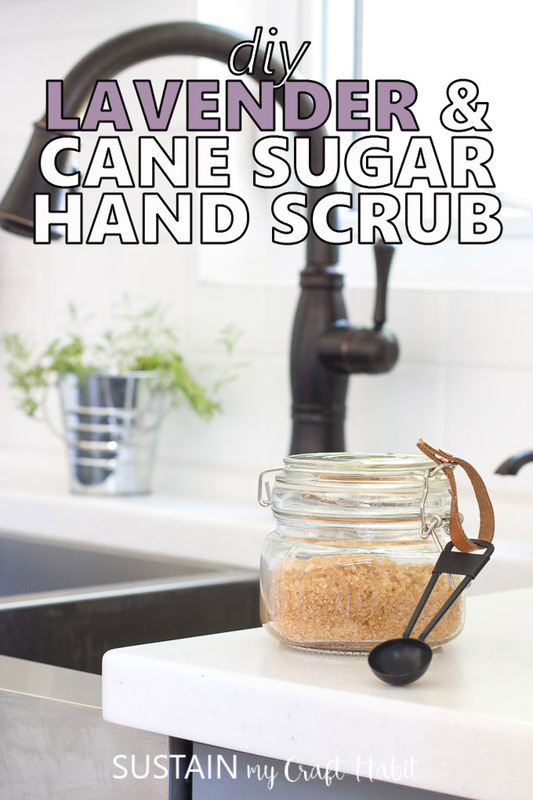 When you’re ready to use the scrub, simply add a spoonful into your palm and massage into your hands, then rinse away. And with our new faucet’s Touch2O Technology a simple touch anywhere on the spout or handle will start and stop the flow of water. Less mess! 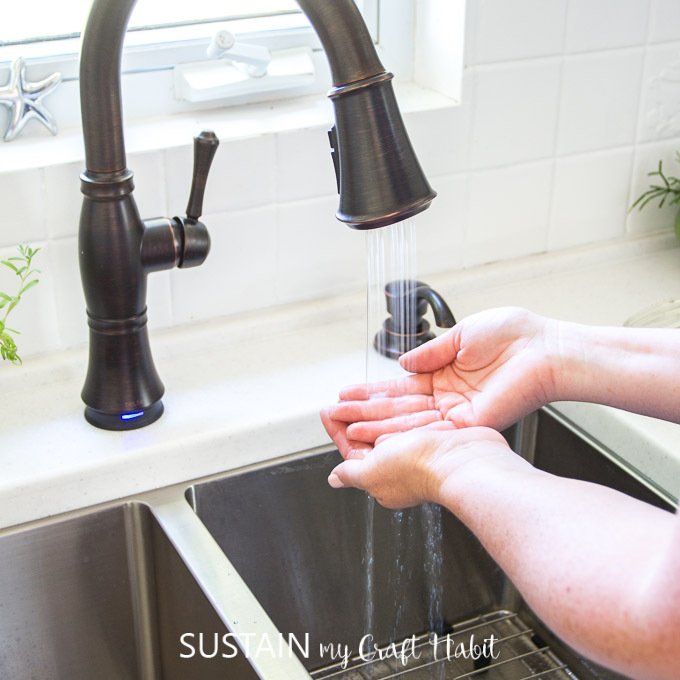 Washing your hands shouldn’t involve making a mess of your faucet. This added feature really comes in handy whenever you’re working in the kitchen- I’m kind of excited about washing the dishes now :). 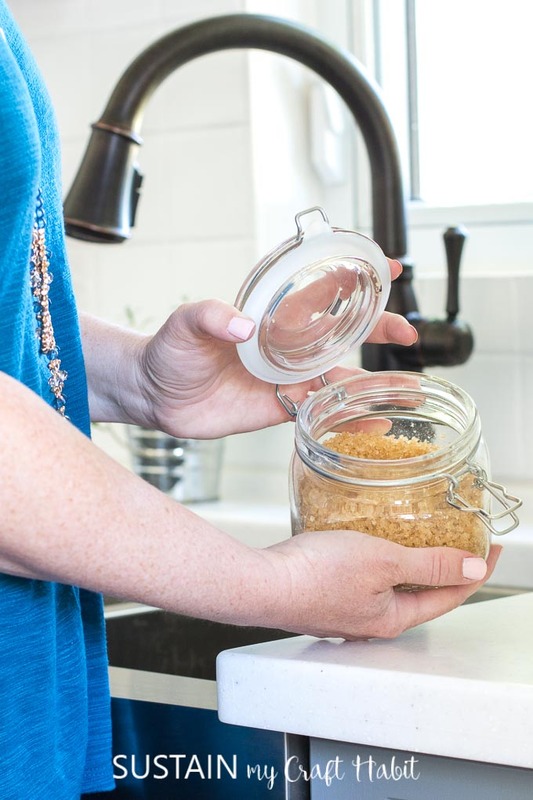 Once you’re done using the sugar scrub, be sure the seal the container tightly. There’s no need for a hand moisturizer after using this hydrating DIY sugar scrub. We hope you enjoyed this sneak peek into our coastal kitchen makeover! 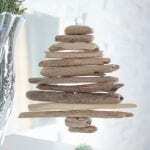 For more project ideas using lavender be sure to explore this lavender and driftwood wreath and these dried lavender jewelry pendants. I have the exact same faucet!! 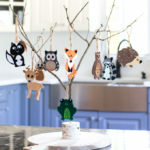 I love it and it goes perfectly with my farmhouse sink! So glad to hear that Allison! We are still getting used to the touch feature but loving so far as well. Thank you so much for stopping by!